File Explorer in Windows 10 contains menus that display sets of tools in an area known as the Ribbon. Depending on what you have selected in File Explorer, the menus that run across the top of File Explorer may vary. All sets of menus, however, contain a View menu and a ribbon of tools that can help you find files and folders by displaying information about them in different ways. With File Explorer open, locate a file, select it, and then click the View menu. In the View ribbon, click Preview Pane. A preview of the selected document opens on the right side of the window, as shown in the figure. In the View ribbon, click the Details Pane. Information about the file appears in the right pane. 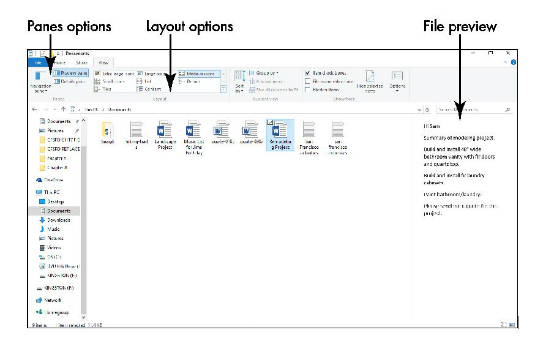 Click various options in the Layout section of the Ribbon to display information about the file in layouts that include information ranging from detailed file information or a simple text list of files, to icons that show a smaller or larger representation of the file’s contents.